Well it recently dawned on me that I haven't posted any artwork of my own on this blog, so here's some stuff. 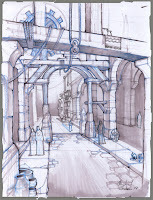 This is a sketch of a Roman alleyway that I did for a Titan Quest 2 project. The TQ2 storyline was based on an alternate Roman time line with fantastical mythological creatures. The city of Rome had endured a number of mysterious earth quakes and as you can see, the citizens quickly constructed a framework of post & beam supports all throughout the city to help the weakened stonework. There are also some giant wooden gears and pulley contraptions that reflect the influence of the great engineer, inventor & astronomer, Archimedes.